Fergus Falls native Nancy Valentine could have moved anywhere after earning her degree from the University of Minnesota Duluth. She chose her hometown. “I came to the weighty realization the summer after I graduated college that my grandparents are aging and I wanted to spend as much time with them as I could,” she said. Another reason she moved back was for the rich local arts scene. Along with her positions as E-911 dispatcher for the Otter Tail County Sheriff’s Office, and marketing and membership coordinator for the Otter Tail Lakes Country Association, she is known locally as an artist and musician. “The opportunities to become involved with arts and music in this area are more widely available to me than they would have been in a larger city,” she explained. Any given week may find Valentine playing her ukulele at The Spot’s open mic night, volunteering at the family art table for the Kaddatz Galleries, or setting up her easel around town to work on her own plein air pastel paintings. West Central Initiative tapped the collective wisdom of the West Central Minnesota Labor Develop Council to initiate a new campaign called “Live Wide Open.” Live Wide Open showcases what the region has to offer, including opportunities for rewarding careers while living close to family, friends and the natural amenities that continue to draw many to west central Minnesota. WCI recently launched the Live Wide Open website, livewideopen.com, which includes stories of people who have chosen to live and work in west central Minnesota, as well as featuring cities, counties and employers. 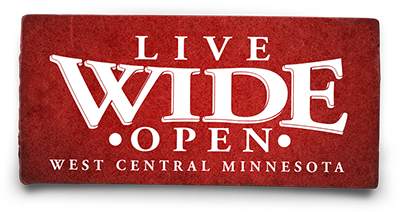 Live Wide Open also has both Facebook and Twitter pages, which can be found at #livewideopenmn. Visit LiveWideOpen.com or contact WCI at 800 735-2239 or livewideopen.wcif.org to learn more.